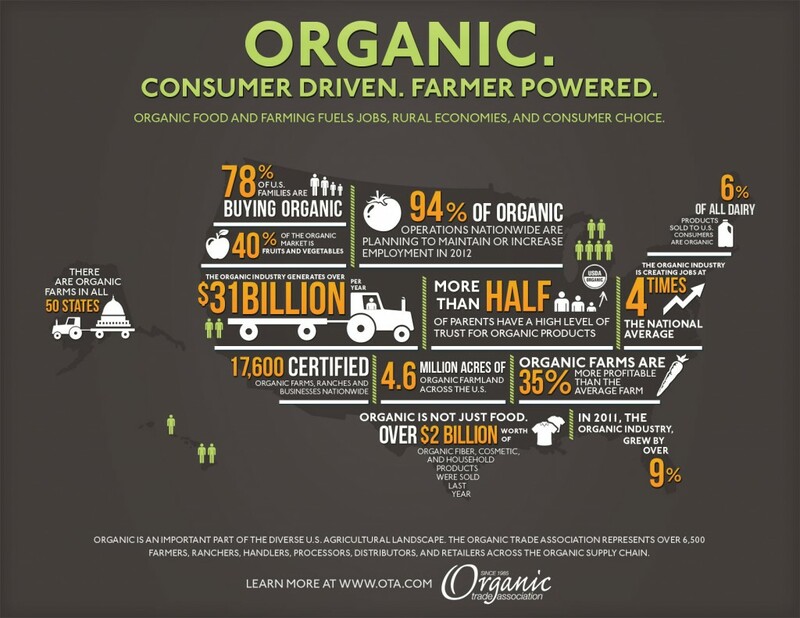 As we head into the throws of the summer and the coming onslaught of fresh produce from local growers hitting the markets, we thought it might be helpful to provide a little information literacy into the world of organic foods. We’ve long taught our students to read the nutrition labels to compare serving size, fat content, ingredients, and more using real props such as cereal boxes. But now that organic food has become mainstream in supermarket chains, it makes sense to educate our students about organics as well. 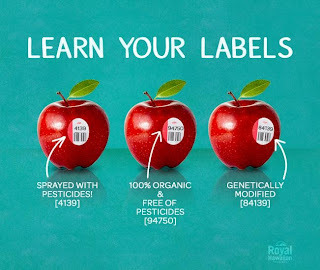 Since this is a multi-billion dollar industry today, we want our learners to know what it means to be organic, whether it is safer to eat, what are the nutrition facts, and how to read food labels. The motion graphic What Is Organic Food from Epipheo is a good resource to start with to help students understand organic foods and, more importantly, that just because something is organic, it doesn’t necessarily mean it’s good for you, healthy, or nutritious. As the video points out, organic chicken nuggets, mac ‘n cheese, or sandwich cookies can still be considered “junk food” without pesticides. It is how the food is created, prepared or raised without chemicals, genetically modified organisms, or radiation in the process. These are just a few examples. In other words, it doesn’t necessarily mean that ingredients are nutritious, just that the ingredients are organic. 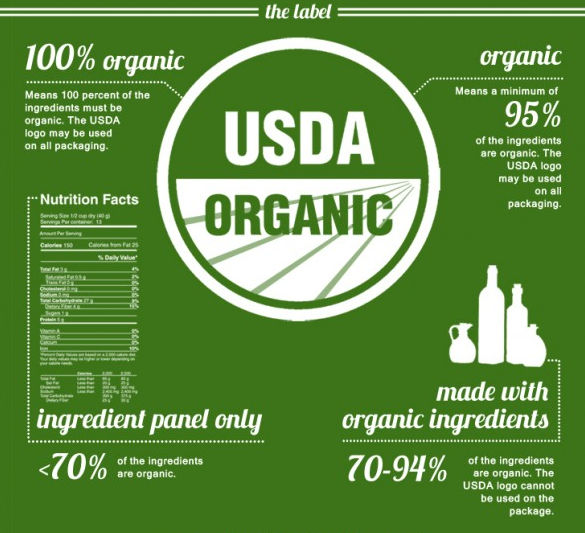 If we want our kids to be smart consumers, they need to know who gets to use the USDA Organic label. 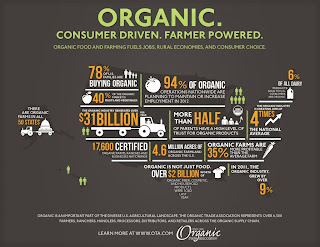 The infographic "What Does Organic Really Mean?" provides a clear layout to explain who can use it. Only food where a minimum of 95% of the ingredients are organic can use the seal. 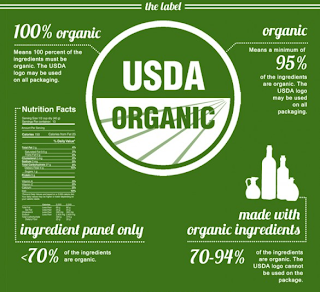 Food that is between 70-94% organic cannot put the label on its products. Marketing and packaging of food is no different from any other industry trying to sell its products. A little media literacy goes a long way in helping kids, and adults, make healthy choices. The Mayo Clinic’s page on nutrition and healthy eating gives a short overview of the real difference between organic foods and their traditional counterparts as to nutrition, safety and price. It makes a point that “organic” is not interchangeable with “natural.” Other terms that can also be misleading to consumers are “all natural,” “free range,” or “hormone-free.” These products are not organic. Lastly, many consumers, let alone kids, are not aware of what those little stickers mean on every piece of produce we purchase. They are called “price look up codes," or PLUs. However annoying these little stickers might be, they provide valuable information about the food we're buying. 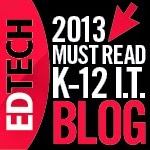 So it makes sense to help students know what these numbers mean. 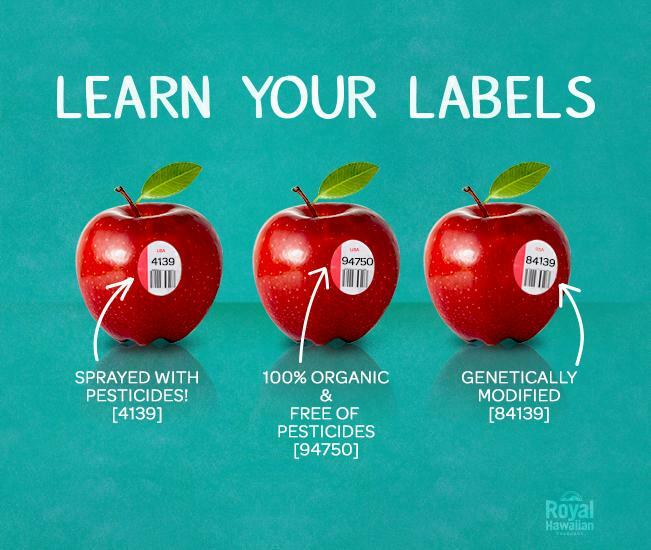 The simple graphic called “Learn Your Labels” explains it all. If the produce is organic, the five digit code starts with a 9, if it is a genetically modified organism (GMO) an 8, and if it is conventionally grown a 4. Information and media literacy are important aspects of the learning process and equally so in making healthy choices. Anytime we can add to the overall knowledge of consumer information for our students, the wiser they become about scrutinizing the world around them. These are the dog days of summer, which is fitting given the sexual brouhaha over New York City's mayoral race. The world may be fawning over the royal baby, but the cable stations stateside can't resist lingering over the lurid details of former Congressman Anthony Weiner's ongoing scandal. Since the spotlight is already on election politics, therefore, it seems as good a time as any to examine the relative prospects for each mayoral candidate based on his or her campaign design. If you teach older students, particularly in high school or university government classes, it's also an opportunity to debate the impact of financial and sexual scandals on political fortunes. The data is not as clear cut as you might think. Check out this study from researchers at Yale University and the University of Illinois, titled "Are Financial or Moral Scandals Worse? It depends." The New York polls change daily as each news bulletin breaks. From a visual standpoint, however, there are obvious winners and losers in the originality and effectiveness of the candidates' logos. Twelve contestants are heading into the primaries on September 10, 2013, but only a handful have an actual shot at winning the mayorship. Also, because NYC registrations are almost 60% Democratic, it's likely the primary will decide the office. Democrat Anthony Weiner may be getting most of the current attention, but his campaign placard is as much of a mess as his personal life. The immediate visual response is fairly arresting, with two bold banners of blue and orange and his last name in looming block letters. But the unfamiliar pumpkin color and the bleed of the font into the white horizontal divide fashions a fuzzy union. Also, most of the letters meet at off-kilter points, leading to a jarring eye-line. The only aligned elements are the "N" and "Y," which together yield a scheme better suited for the NY Mets. Democratic Council Speaker Christine Quinn offers a more subtle, contemporary motif in her layout. Her tones of blues, French on denim, seem Obama-esque in the modern shade and the defining "Q." The even-more-interesting letterface, lowercase Solomon Book over uppercase Solomon Bold, creates an inviting pairing. Overall, her poster seems personal and approachable, which perhaps was the intent given news reports of her behind-the-scenes temper. Democratic Public Advocate Bill de Blasio presents the most memorable trademark of the bunch. His scarlet red background stands out in a field of blue competitors, and the nestling of his first name into his nobiliary particle adds an appealing uniqueness to his bright canvas. In fact, the commercial optimism of his emblem seems more fitting for the supermarket aisles, closer in cousin to the labels for Pocky sticks, KitKat candy, or Muller yogurt. Democratic Comptroller John Liu also opted for the metropolitan orange and blue. The silhouetted skyline beneath his slogan renders a nice urban echo for America's largest city. The net effect is passable and unoffensive, but everything about it seems familiar. The underscoring swipe of white paint and the single star have been featured on similar logos by Newt Gingrich, Tim Pawlenty, and Amazon.com. For a candidate with lower name identification, a more inspiring crest could have been more helpful. Former Democratic Comptroller Bill Thompson has more local recognition, but he suffers from overly common first and last names that need pizzazz to make his marquee marketable. Mindbogglingly, however, his campaign team defaulted to the blandest brand possible. The uninspired white letters on the gradient, midnight blue background supply no vision or ingenuity for the office. To be fair, we've seen posters in Thompson's public appearances that add a few white stars beneath the same generic blueprint. But still, in sum, the result is as forgettable as Thompson's candidacy. Former Chairman of the MTA (and likely Republican nominee) Joe Lhota seems to have settled on the "kitchen sink" approach. He features a font-apalooza, with a new choice on each line, and he includes two slogans where most candidates have none. His goals, in highlighting his years of experience and his vision of unity, are noble. And the azure font with the crimson underline stand out well on the white backsplash. It's difficult, however, to settle on one visual takeaway. Perhaps an artistic icon could have given Lhota some leverage in breaking into the Democratic news stranglehold. Check out our other posts about design and education in elections. A political brand is the same as a corporate brand. Both try to carve out unique identities. They seek to evoke positive emotions and consumer confidence at the mention of their names or at the appearance of their insignia. A familiar logo is the ultimate encapsulation of brand loyalty. 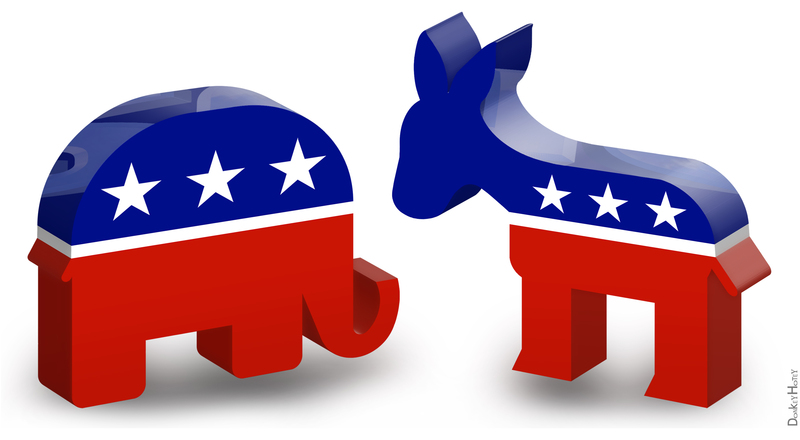 Political campaigns spend hours with focus groups crafting their ideal icons. This messaging becomes part of the larger world of media literacy, which can be a productive way to frame discussions with students each November. It can be difficult to teach civics in non-presidential election years. This constraint, however, actually presents an opportunity, since it allows teachers to focus on the critical role played by state and local governments within the federalist system. Source: Chris Christie For Governor, Inc.
Interestingly, the only two governorships before the voters in 2013 are both in deeply purple states. This offers an additional opening for students to explore the changing nature of the American electorate. The race in Virginia is expected to be a scorched-earth nail-biter. 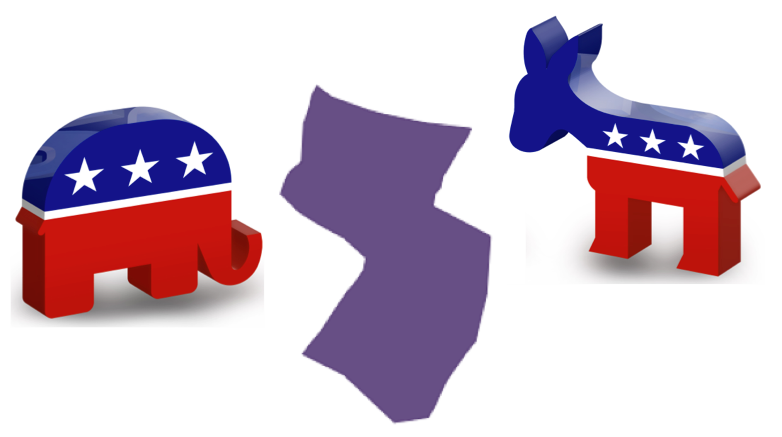 The race in New Jersey, however, is currently tilting entirely in favor of reigning governor Chris Christie. The current polls show him leading 60 percent to 28 percent. Christie's logo evokes this sense of strength and inevitability in the prominent all-caps lettering and the no-nonsense moniker of “Governor.” He is not running “for” governor, nor does he mention any party affiliation. His design reinforces his incumbent status and the de facto nature of his assured return to the capital. Here, Christie succeeds in the “Governor” tag, while Ken Cuccinelli’s similar but over-serifed and presumptuous attempt fails in Virginia. Christie incorporates both dark slate blue and fire brick red texts to unite the two sides of the electorate, and the trio of stars seems a fitting klaxon to underscore his name and tee up his office. As a whole, however, Christie’s placard is something of a mess. Sideways text never succeeds well, since it is foreign to the expected flow of readable text. The minute first name of “Chris” tucked vertically in the left corner is jarring to the eye and unnecessary in a state where the governor has universal name recognition. It also exaggerates the chunky nature of the “Christie” Impact font. The generic slogan at the bottom, “Strong Leadership Now,” is equally as redundant. With an approval rating of 70 percent, Christie doesn’t need to remind voters of his “strength,” especially in an oddly kerned justified blur. In fact, the catchphrase undermines his prior term, by suggesting that “now” the state needs a strong leader (as opposed to the past four years). We like the banner at the top of his website much better, where he eschews the puzzle-pieces and simply features his name and title. The color is a contemporary Tufts blue, and the font is like an elegant, interesting Caronta. The campaign team should have used this modish layout for all of its marketing pieces. Christie’s opponent, Barbara Buono, faces an uphill battle in name recognition, but her logo is a good first start. As a state senator and former member of the General Assembly, Buono has a solid political resume, but she can’t compete with Christie’s successful stewardship during Hurricane Sandy. In mocking up her poster, Buono’s team made several key design choices. Similar to Terry McAuliffe’s squad in Virginia, they opted for the increasingly popular pistachio color, which until recently was almost unheard of in red-white-and-blue politicking. The green juxtaposition with the charcoal gray background gives a popping quality to the bold serif Frusta of her all-caps name. The subtitle in fine white Kohinoor Latin prominently mentions her political party, which many candidates opt to obscure in order to reach independent voters. Buono is making a key calculation that with her low voter identification, she should appeal to the state’s Democrats, who make up the majority and who twice elected President Barack Obama. While Christie did not include a logo, Buono’s trademark is the state itself, textured and encircled by a ring of stars. While simple and not terribly original, it’s a solid choice for a politician trying to amplify the authority of her candidacy. Even though she’ll likely lose at the polls in November, Buono wins in the modern appeal of her brand. Over the course of our research, we've gathered a number of resources to help explain financial and economic information to our students. 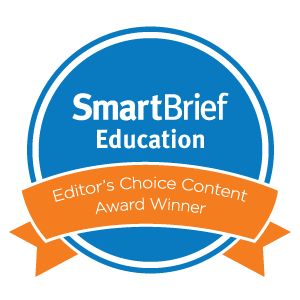 These short motion graphics captured their attention and engaged them in the learning process far beyond our expectations. Since the videos are scattered throughout our posts on financial literacy, we decided to do a quick roundup here for the sake of convenience. Feel free to click on each of the headings below for lesson plans and project ideas related to each topic. This motion infographic prepared by the Council for Economic Education shows the alarming statistics about monetary awareness. It brought to light the ever-growing need for more financial literacy in our schools. Even though many states have recently enacted requirements for students to take an economic or personal finance class to graduate high school, we should push for curricula in the middle school years when financial habits are beginning to form. This animated film on economics and the interdependence in producing manufactured goods in a free market economy captivated our students. By using a low-tech tool that all kids use, the presentation provided an insightful look at the intricacies that go into producing a pencil, and it gave learners a real-life look at the many people who worked together to make it. This motion graphic highlighted the reality in earnings between the rich and the poor, which is quite different from the perception of most Americans. This visualization used charts, graphs, and images to give the students the hard reality of the distribution of wealth in the United States. Our students were quite surprised at how skewed the reality is from what most believe to be true. Demon-Ocracy Info produced the following powerful, animated video to visualize the debt in the United States as physical $100 bills. Somehow the swallowing effect created by the bills engulfing Lady Liberty really hit home with our students. It set in motion a host of questions, particularly with regard to the "fiscal cliff" earlier this year. Last year the 1040 Tax Form reached its centennial anniversary. This short video paved the way for kids to learn how the federal income tax works and who pays what percentage. They quickly learned why "tax day" on April 15 is not something working Americans look forward to every year. Technology & Specialization - How To Cultivate Master Teachers? As more and more states opt out of the Common Core requirements, the question mark looming over U.S. education grows more and more daunting. Each evening our Twitter PLN lights up with creative ideas about project-based learning, flipped engagement, and BYOD flexibility. But these are not the national norms. The morning news, in fact, registers exactly the opposite, with more and more stories about regrettable school closures, bungled teacher ratings, and bubble-sheet scandals. The coast-to-coast consensus on a direction for student learning seems as unattainable as ever. Public, parochial, independent, charter, and home school options are all good-faith models of teaching and learning. But it's like the debate over school vouchers -- with so many options, who is being left behind? The Common Core initiatives at their best are attempts to elevate skill expectations and to implement desired outcomes across the country. At their worst, however, these new standards simply replace old standards. One size still fits all, and rote testing becomes both the symptom and the prescription for the lingering malaise. We recently came across a motion graphic from Public Impact, made in conjunction with Column Five Media, which offers several novel proposals for upending America's schools. These suggestions differ by focusing on the teacher. They imagine how the best educators could apply their training and their time to best effect. We don't yet know much about Public Impact as an organization, and we're trying to read up more about the group's point of view. The Advisory Team does feature some respected names, and as a stand-alone video, the clip presents notions worth considering. According to Public Impact, these changes could instill an "Opportunity Culture," which would subsequently lead to higher salaries. We like this scheme more than, say, the "Teachers Pay Teachers" construct, which turns educators into corporations. Some of the Opportunity Culture details do seem still in the conceptual phase. It's also unclear how exactly a small handful of teachers would be labeled "expert" among the larger pool of "other" teachers. But as fuel for the continued educational discussion, these propositions seem worth adding to the fire. The End of the Test? Please check out our earlier post in Part 1: "Why Teachers Should Care About Typography." Students hate Times New Roman. They hate it more than they hate Courier. At least to them Courier seems like a quaint typewriter. Times New Roman, however, has a stupid name. The three words hardly go together. The font is boring enough to be boring and ornate enough to be annoying. Also, at 12-point, which all teachers seem to demand, it doesn't fill up a page nearly as much as Trebuchet or Verdana. Amid a lengthy drop-down menu of fonts, virtually no student can offer a compelling explanation about why Microsoft (old!) and teachers (old!) are fixated on Times New Roman. 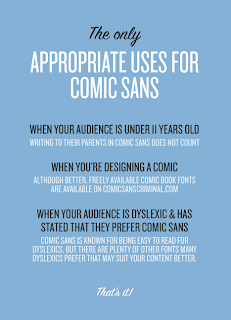 Students love Comic Sans. Elementary learners love seeing it on their homework pages. Some skeptics might say they like it because they don't know any better, but in fact they know enough. Kids respond to Comic Sans' "non-font" status. It looks like child chalk, not parent script. It is not fussy, it is not adult-ish, it is not foreign to a marble notebook, and it is not counter-intuitive to a child's handwriting. Students like Comic Sans because Comic Sans likes them. And with a little bit of exposure, they would happily pick from a cornucopia of other more interesting fonts, should they be given the chance to control their destinies. Most tech-types disdain Comic Sans for its overuse and undersophistication. 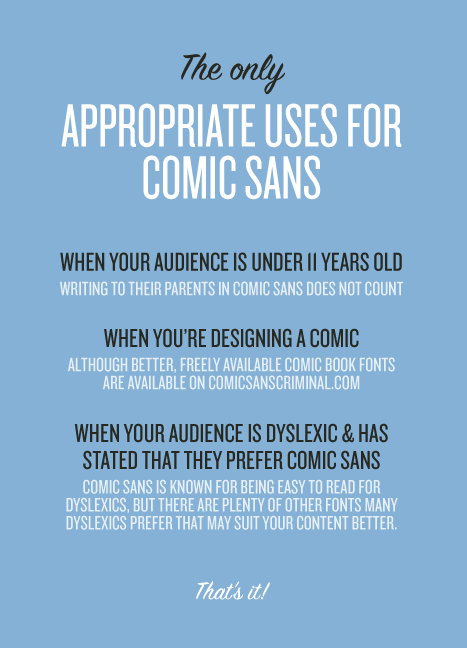 There is a popular Ban Comic Sans website, a Kill Comic Sans video game, a Comic Sans Project Tumblr, a Comic Sans criminal pledge, and a satirical Comic Sans song. 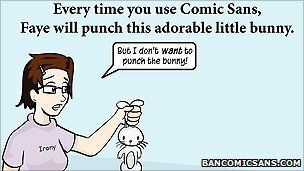 Michael Stevens of Vsauce, however, has produced the brilliant "A Defense Of Comic Sans" video that explores the reasons for Comic Sans' pop-culture proliferation. As he notes, "when words and letters are printed, they have to wear the clothing of a typeface, a font family. We don't always think of it this way, but you cannot type without using a typeface." 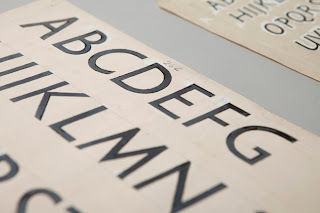 In essence, the video offers a quirky (and surprisingly scholarly) history of how typefaces ("Textura") emerged from the Guttenberg press, and how French pieces that had to be melted ("fondue") ended up establishing the nomenclature of letter forms ("fonts"). Other fascinating revelations include the reasons for the lower- and uppercase names and the actual origins of Comic Sans in the cartoon imagination of Melinda Gates. Amid all of the debate, Corey Holms points out that "Comic Sans is proof that design works. 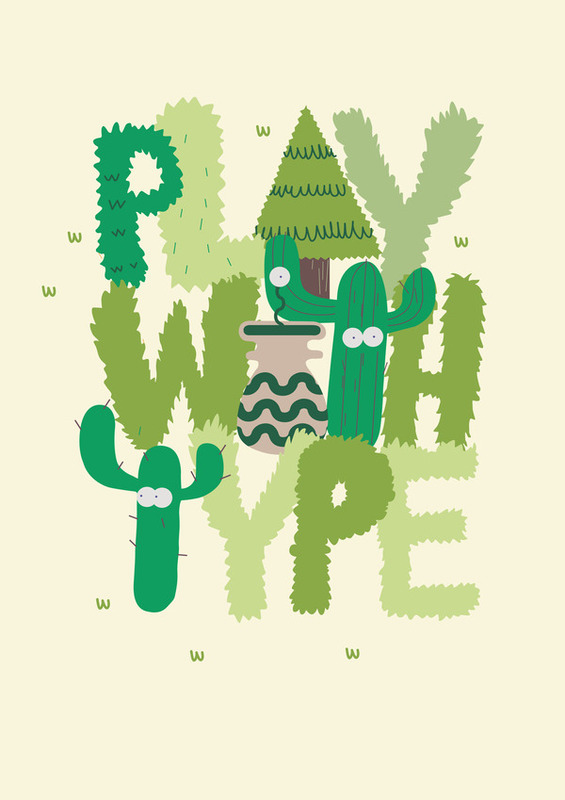 The public understands that type means more than words." That's why children like it, because it appeals to their imaginative sense. And David Kadavy argues that, "Just as interchangeable type led to a spread of literacy, Comic Sans and the personal publishing it comes along with should lead us toward a spread of design literacy." This thesis reinforces the reasons why we as educators should explain to our students each visual choice that we make. We should mention why we have formatted our Keynote slides in a certain way, or why we have selected a particular typeface for a particular use. In drawing back the curtain on our own aesthetic rationales, we model for our classes the possible thought processes that they, as designers, might make in their own projects. Kids live in a web world. They scroll Instagram comments and Twitter updates. They subconsciously digest the letter forms used on these popular sites. They don't understand, therefore, why their term papers should be typed in priggish serifs. They want their Wuthering Heights words to scaffold the screen in contemporary letters. They want the multi-tasking efficiency of their daily regimen to be somewhat echoed in the academic crispness of the letters they clack onto the page. If you show us a blog that's written in Times New Roman, we'll show you a blog that kids aren't reading. Try an experiment in class: tell your students to open up Microsoft Word or Pages, and tell them to pick a font for their writing. We'll bet our morning coffee they don't pick TNR. As digital natives, kids today are bombarded with ads in YouTube clips and web banners. They aren't yet trained to dissect and repel these media influences, but they see them, and they know them, and they make choices about them. That's why students should care about typography. Because in the same way that glitzy logos attract their respect, other fonts could give credence to their creative in-class projects and could boost their grades in open-ended PBL endeavors. If you tell students that a font will raise their grade, they'll listen. If you tell students to choose a design scheme that will complement their message, they'll skip the default blueprint and instead choose an inventive layout. Students think Gothic or Roman fonts are old-fashioned, until they realize that Juicy Couture for years has intentionally been playing off the heritage reputation of an over-styled letterface in its tween marketing campaign. 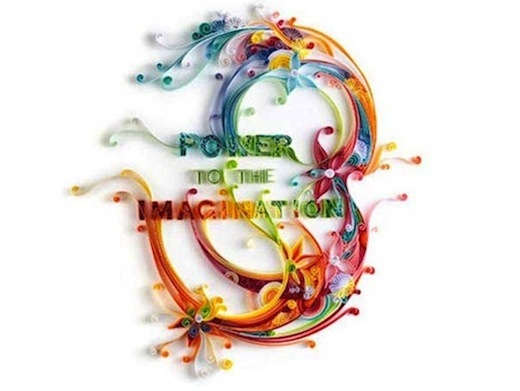 A realization of the power of type could mean wondrous outcomes in student projects, such as Prezi presentations or iMovie embeds or Tumblr pages. 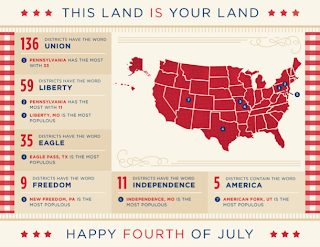 Typographical Infographics That'll Make You Go "Wow!" The organic way information is set in motion on the Internet is changing advertising into a dynamic, shared experience. With images at its core, the designing of information specifically for the web is altering how we think and how we respond to that experience. Digital advertising can reach large audiences, and it is perhaps the fastest growing sector to master the art of transliteracy. Digital messaging pushes us to think differently when we come into contact with it, because the technology has the ability to manipulate the media across platforms, on devices, and by people. It’s also far more interactive. Participants can also quickly share what they unearth with others, and we don’t just mean one-to-one. We can reach hundreds, if not thousands, with one tweet, Facebook like, Linkedin group, or blog post. The motion graphic from Epipheo called “How the Internet Is Changing Advertising” is a good resource to help learners understand the impact of marketing information on the web and its effect on an audience. It is self-promoting to be sure, but the message is clear. The value of the image in communication and design is a game-changer for advertisers. 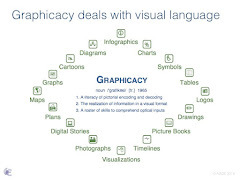 Motion graphics, video, and interactive infographics are made specifically for the web. These eye-catching and engaging deliveries to endorse or advance an idea or product are one of the fastest ways to push out a message. Their proliferation on the Internet is pervasive, and advertisers depend on their discovery. The hope is that our discovery of them gets shared with our followers, friends, and connections. As a result, the encounter takes on a familiarity and a likelihood that others will share that experience even further. Essentially, our connections ultimately broaden an advertiser’s reach. This is why continuing to reinforce the skills of media literacy is so vital to our learners. The seamless shift of information, the slickness in its design, and the appeal to the viewer’s sensibilities as something familiar make it difficult for learners to separate fact from fiction. Media messages on the web, just like any other, are designed to attract and promote. Our kids need to know this, and we need to continually reinforce it. Ironically, this post about this short motion graphic from Epipheo will be shared with our readers and followers. It will no doubt promote its message about having an epiphany that will lead to other epiphanies as its closing message purports. We like the message about have an illuminating discovery to think differently about things. In doing so, be media savvy. Check the source, look to see if it’s an advertisement, and don’t be fooled by the creativity. 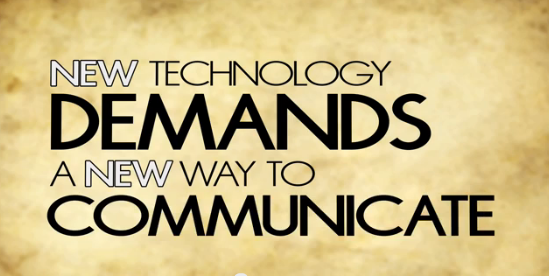 We’ve moved from being passive viewers of information to wanting to communicate what we encounter with others. That’s okay; just take a minute to evaluate it. With all the violence in the world today and the daily barrage of recent protests in Egypt and Brazil, we should count our stars and stripes that we can go about our routines this 4th of July. To be sure, there will be plenty of barbeques, shopping, and fireworks, but we should take the time to reflect on our freedom and independence. 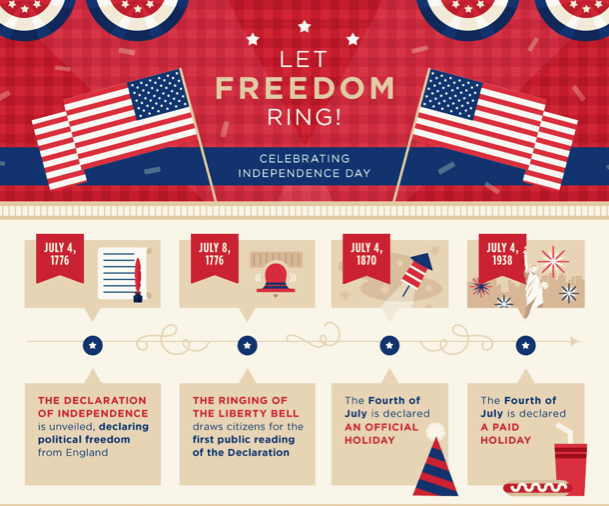 The infographic “Let Freedom Ring: Celebrating Independence Day” created by Quicken Loans is a proud look at the history of the United States using data from the U.S. Census. One of the things we like most about this particular holiday visualization is the comparison made throughout between 1776 and 2013. It’s also loaded with patriotic facts, from districts with names such as union, freedom, and liberty to who is Uncle Sam. 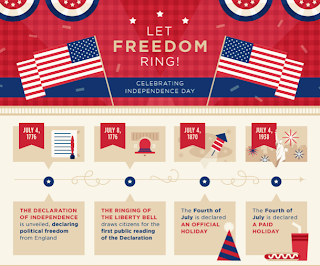 Of course there’s a little economics regarding the amount spent on red, white, and blue décor, as well as the total value of imports and exports of fireworks. 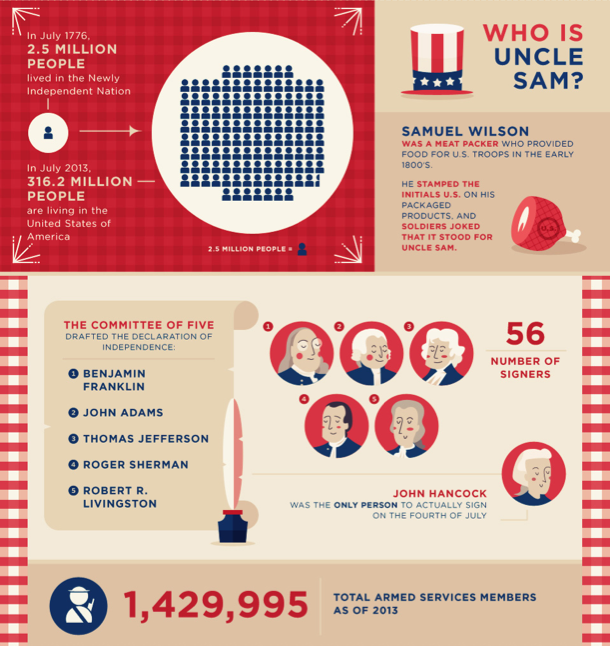 While we know that school is out for the summer, this infographic would be a nice addition to use in American history or civics classes. For the time being, let’s just say “Happy 4th of July” and be grateful for all those who serve today to protect our freedoms. 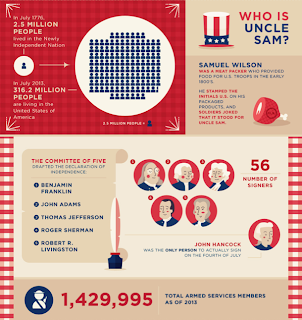 Click here to check out some other festive holiday infographics. Please check back for Part 2: "Why Students Should Care About Typography." The purpose of typography is to communicate. That is its essential function. 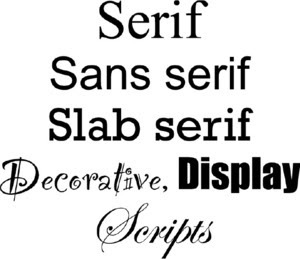 Any classical definition will tell you that font families and typefaces exist only to craft the most effective message for the most appropriate audience. Any design, therefore, that works to undermine that goal is a suboptimal type. That is why teachers should care about typography. They are both in the communication business. In fact, if you take the classical definition above and replace a few words, it sounds like a fairly appropriate description of the role of an educator: to deliver information and to design insight. Teachers have actually been teaching about typefaces for years. They regularly scaffold formal outlines with Roman numerals and lowercase letters to show students what is more and less important. The traditional third-grade instruction in cursive lettering is another argument for the time-honored importance of word-craft. Elementary schools recognize the higher-level thinking and the patient practice required in transitioning from block letters to fluid script. In fact, the current consternation over whether to abandon cursive writing for the laptop generation centers on whether to give up on a refined art that was once held sacrosanct. If you haven't yet seen the video above, by Ben Barrett-Forrest of Forrest Media, that's been making the rounds of blogs and Twitter, it's a must-watch. Tracing the history of typography in stop-action, hand-and-paper style, the clip marches engagingly through all of the innovative advances in printing and lettering. A shorter, lower-tech clip from Art Factory that focuses on animated or kinetic typography is another good gotcha film for grabbing student attentions and introducing the potential of well-chosen styles. 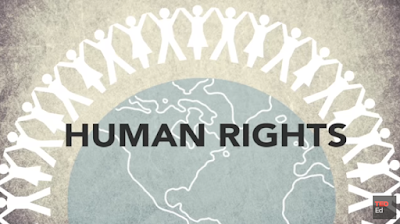 Typography Sample from Art Factory on Vimeo. By taking typography into account, teachers can't help but help students. Whether filling in PowerPoint slides or typing up worksheets or writing unit tests, teachers can make purposeful decisions regarding letter families. A crisply arranged page makes information delivery neat and tidy. A gaudy or funky font on the screen elicits smiles and coaxes curiosity. Carefully laid-out assessments can mean all the difference in students' ability to demonstrate learning. In fact, many children with IEPs or distinct learning styles have genuine trouble making sense of dense fields of words. Considerations of spacing, leading, and kerning can help these learners do their best (and also fulfill what may be legally mandated by district classifications). 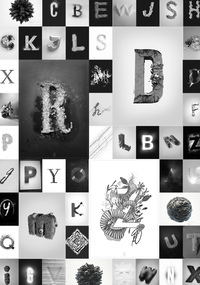 The following articles offer valuable resources for learning and teaching about typography. The first post is especially relevant, with a thorough, visual explanation of how to format pleasing text and how to avoid frying the eyes of viewers. 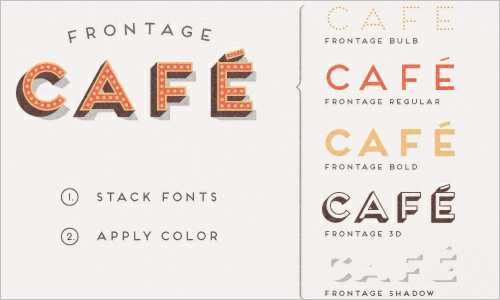 Finally, the example above from designer Yulia Brodskaya is a nice graphic to use in a classroom discussion of fonts. It's right on the tipping point between flash and substance. Teachers can throw it up on the screen and ask students about the pluses and minuses of the colors, shadows, and swirls as an overall communication elements. Typefaces, in this case, exemplify our favorite mantra in student projects, which is "content first, pretty second. " Our kids enjoy chanting it when we go through various PBL steps in class, and they'll probably enjoy repeating it for typography, too.